Yeah, I like that, too! And the fabrics are fun. The button raindrops are my favorite part. Nice! got my wonderful patches from TAOJ - so cute and well done. Thank you so much. sorry for the shadow but work cuts into my useable free time why too much lately. so had to get the pics this morning before work. Goat goddess , those are beautiful patches but they are not from me. I received yours as well and I’m sorry I didn’t let anyone know. Last week was very difficult. Sorry you had a rough week, Ladybugs! Mine was bad, too. I love the patch with the little crocheted embellishments... I count 10 of them! endymion, I hope this coming week is better for you! Thank you for your well wishes too! DAY OF THE DEAD! I have this fabric and never, ever thought of using it in this way! It has a turquoise background. The skeleton is a woman and has on a lacy type hat that is printed on the fabric. Well, JoyfulClover did one better and added her own taffetta fabric to make a top part of the hat and used metallic thread to sew it on!!!!!!! (I've never used it, but I've heard it's a b&%#h to use.) She even added a little red rose on top of it. Ok, this is the part I wish you could see, b/c I have no idea what this stitch is but it looks like she literally must have spent hours doing this. There is a circle of yellow around the skeleton on the fabric. JoyfulClover embroidered THIRTY-YES THIRTY-flowers around the circle of yellow!!!!!!! She even embroidered the leaves that were around it with green thread!!! The thread around the patch is pink, and on the back she used a different DOTD fabric. Get this, even the back is "clean", she covered the stitches! LADYBUGS!!!!!!!!!!!!!! This is such a clever patch that again, highlights JoyfulClover's ability to embroider! The fabric has bunches of leaves all over it in different shades of green. She sewned on one ladybug button. She then took black buttons and used red thread to make the other nine ladybugs!!!!!! It's so freaking cute!!!! I've never seen anything like it!!!!! 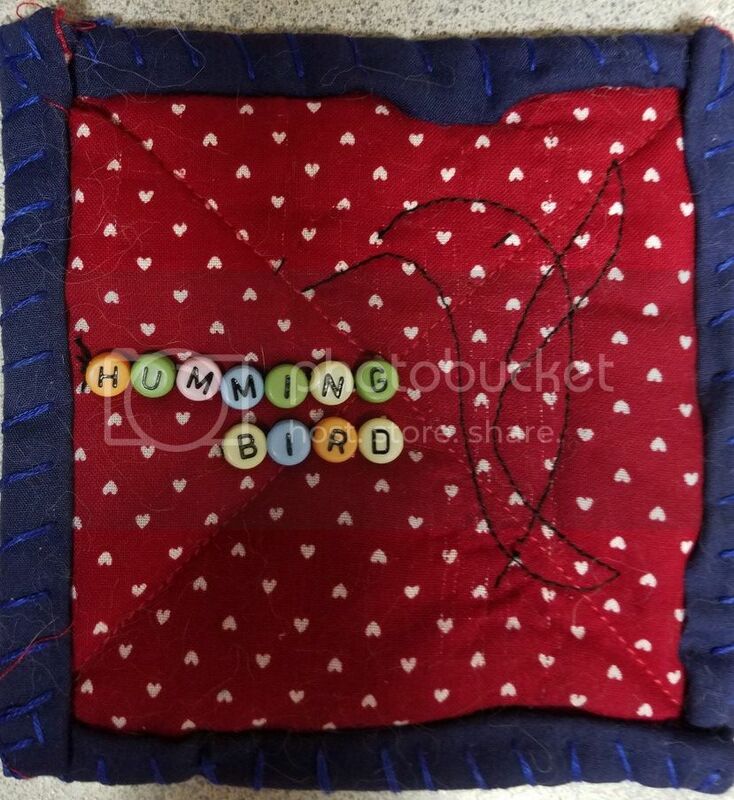 She used a bright green stitching around the patch, and red fabric with hearts on the back. The back on this one is "clean" too. BEE AND COMBS!!!!!!!!!!!!!!!!!!!! This patch has yellow fabric with white geometric shapes on it that look somewhat like the combs inside a beehive shapes. Joyful clover used brown thread to sew around some of the combs and the same thread to sew inside some of them, to make them look like they were filled. I'm not sure how she did this part, but it sure is beautiful and intricate!!! She embroidered a bee-about two inches in length and three in width- on white fabric and used white lace for the wings. 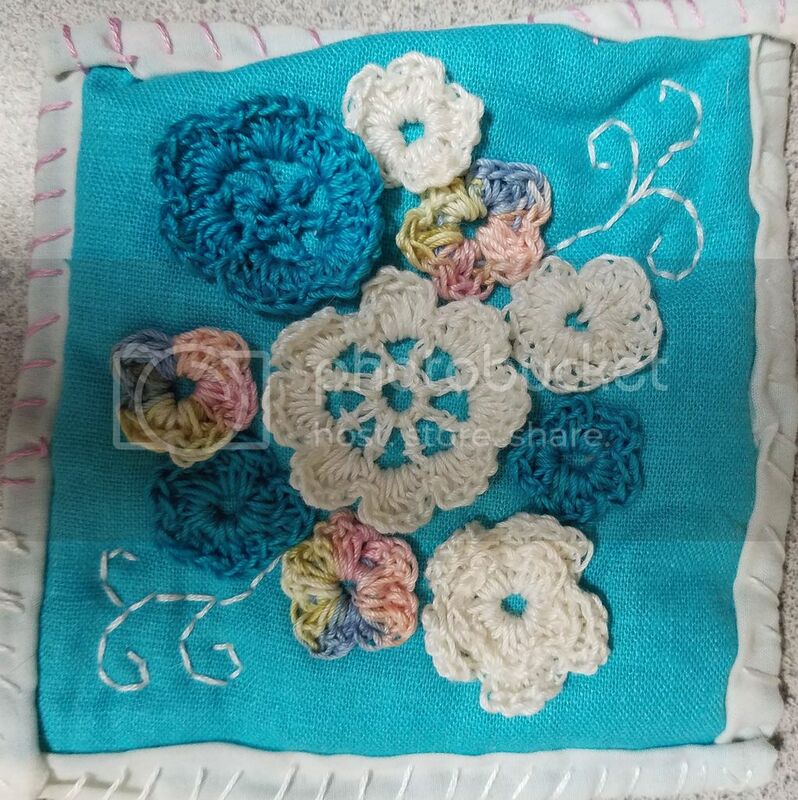 She used bright yellow thread around the edges and turquoise fabric on the back. Again, the back is "clean". These patches are amongst the most intricate and beautiful of any I have received! Thank you so much, JoyfulClover! I CAN POST PHOTOSSSSSSS!!!!!!!!!!!!!!!!!!!!!!!!!!!!!!!!! THANKS TO ACADIANDRIFTWOOD FOR GIVING ME THE LINK TO PICASA!!!!!!!!!!!!!!!!!! WHOOOOO HOOOOOO!!!!!!!!!!!!!!!!!!!!!!!!! And since I can NOOOOOOWWWWWWW post, here's what goatgoddess sent me! Those are all great! I love that they both sent you Ladybugs...and...Bumblebees! All so cool! I need to learn how to make those button ladybugs. They’re awesome! 2 cute little houses... I call it the neighborhood! Thank you TAOJ for being such a wonderful partner and working with me! The turquoise crochet is stunning! I also like the stitching technique on the houses. And the hedgie print is so cute!